Landing Craft Infantry Officers and Crew consistently demonstrated heroic actions during World War II. Their courage and devotion to duty under extremely hazardous conditions were in keeping with the highest traditions of the United States Naval Service. For their distinguished service and acts of valor, many were decorated with combat medals. The following list of combat award recipients was developed using the Military Times Hall of Valor database but is not a complete record. The LCI awardees listed below include those LCI Officers and men that received the Medal of Honor, the Navy Cross, the Silver Star, the Bronze Star, the Navy and Marine Corps Medal, and the Legion of Merit. This list of decorated LCI veterans will be updated as new information is obtained or becomes available from the Hall of Valor site or from other sources. The Medal of Honor is the United States of America’s highest and most prestigious personal military decoration that may be awarded to recognize U.S. military service members who distinguished themselves by acts of valor. For conspicuous gallantry and intrepidity at the risk of his life above and beyond the call of duty as Commanding Officer of Landing Craft Infantry Gunboat FOUR HUNDRED FORTY-NINE (LCI (G) 449), operating as a unit of LCI (G) Group EIGHT, during the pre-invasion attack on Iwo Jima, Ryukyu Islands, on 17 February 1945. Boldly closing the strongly fortified shores under the devastating fire of Japanese coastal defense guns, Lieutenant Herring directed shattering barrages of 40-mm. and 20-mm. gunfire against hostile beaches until struck down by the enemy’s savage counter-fire which blasted the 449’s heavy guns and whipped her decks into sheets of flame. 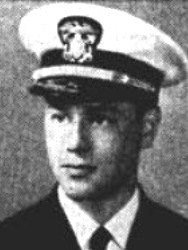 Regaining consciousness despite profuse bleeding he was again critically wounded when a Japanese mortar crashed the conning station, instantly killing or fatally wounding most of the officers and leaving the ship wallowing without navigational control. Upon recovering the second time, Lieutenant Herring resolutely climbed down to the pilothouse and, fighting against his rapidly waning strength, took over the helm, established communication with the engineroom, and carried on valiantly until relief could be obtained. When no longer able to stand, he propped himself against empty shell cases and rallied his men to the aid of the wounded; he maintained position in the firing line with his 20-mm. guns in action in the face of sustained enemy fire, and conned his crippled ship to safety. His unwavering fortitude, aggressive perseverance, and indomitable spirit against terrific odds reflect the highest credit upon Lieutenant Herring and uphold the highest traditions of the U.S. Naval Service. The Navy Cross is the US military’s second-highest decoration (only behind the Medal of Honor) that is awarded to those for valor in combat. For extraordinary heroism and distinguished service in the line of his profession as Commanding Officer of the U.S.S. Landing Craft-Infantry TWO HUNDRED NINETEEN (LCI-219), during operations against the enemy off the coast of Normandy, France, on 11 June 1944. 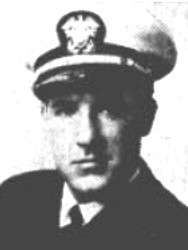 When his ship was riddled by explosions of an aerial bomb, Lieutenant Commander Corsi rallied the wounded members of his crew and despite severe wounds from shrapnel splinters in his head, neck and leg, attempted to beach his ship with the assistance of a Submarine Chaser. Fighting fires throughout his vessel and aiding in the removal of the wounded until it was apparent that the LCI was about to capsize and sink, he ordered his men to abandon ship and, after all personnel had been evacuated, left the sinking ship and shortly thereafter collapsed from his serious wounds. Lieutenant Commander Corsi’s courage, leadership and gallant devotion to duty upheld the highest traditions of the United States Naval Service. For extraordinary heroism and distinguished service in the line of his profession as Commanding Officer of Landing Craft Infantry Gunboat THREE HUNDRED FORTY-EIGHT (LCI(G)-348), operating as a unit of LCI(G), Group EIGHT, a close-in fire support ship, during the pre-invasion bombardment of Iwo Jima, Volcano Islands, on 17 February 1945. 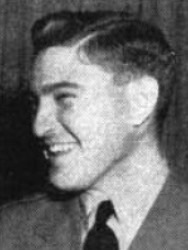 By cool and capable direction when ordered into the field of enemy fire to render assistance to seriously-damaged ships of his Task Unit, Lieutenant, Junior Grade, Rosenbloom fearlessly closed the range and materially contributed to the salvage of several ships. His conduct throughout distinguished him among those performing duties of the same character and were in keeping with the highest traditions of the United States Naval Service. For extraordinary heroism and devotion to duty in action against the enemy while serving aboard Infantry Landing Craft U.S.S. LCI(L), FOUR HUNDRED FIFTEEN (LCL(L)-415), during the amphibious assault on the Normandy Coast of France on 6 June 1944. Electrician’s Mate First Class Shields unhesitatingly plunged to the aid of two drowning soldiers in water under enemy shellfire on the Omaha Beach Although tired from swimming ashore with grapnel and line to test the depth of the water before disembarking troops, and although he had voluntarily made the trip once through shrapnel-splashed water, Electrician’s Mate First Class Shields did not hesitate to jump in once more when he saw the two soldiers in dire need of aid. Through his efforts, the lives of these men were saved and they were carried through the deep water to the shore. Later, he went aboard the U.S.S. LCI(L)-416 disabled on the beach because of mines and shellfire. 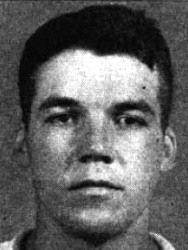 In helping to carry a wounded member of the crew of that ship along the beach, Electrician’s Mate First Class Shields was killed by shrapnel. His exceptional courage and valiant devotion to duty in the face of grave danger were in keeping with the highest traditions of the United States Naval Service. He gallantly gave his life for his country. For extraordinary heroism and distinguished service in the line of his profession as Commanding Officer of Landing Craft Infantry Gunboat FOUR HUNDRED THIRTY-EIGHT (LCI(G)-438), operating as a unit of LCI(G), Group EIGHT, during close-in fire support operations against enemy Japanese-held Iwo Jima, Volcano Islands, on 17 February 1945. With his vessel listing dangerously and shipping heavy seas following a direct hit as he closed the heavily fortified enemy shores against the overwhelming might of powerful coastal defense guns, Lieutenant, Junior Grade, Powers valiantly proceeded at slow speed and, directing his craft close inshore, succeeded in maintaining his position in the firing line. Stout-hearted and courageous, he continued his accurate, sustained barrage against his assigned beachhead area until ordered to withdraw to save his craft from destruction. By his expert seamanship, unwavering fortitude and indomitable spirit, maintained in the face of terrific opposition, Lieutenant, Junior Grade, Powers rendered gallant service in support of a successful reconnaissance carried out by the Underwater Demolition Team and to the initial invasion operations launched two days later to capture this vital Japanese stronghold. His decisive conduct and constant devotion to duty throughout upheld the highest traditions of the United States Naval Service. For extraordinary heroism and devotion to duty in action against the enemy while serving aboard Infantry Landing Craft U.S.S. LCI(L), FIVE (LCI(L)-5), during the amphibious assault on the Island of Sicily on 10 July 1943. Determining the depth over sand bars by swimming toward the beach within hazardous range of hostile guns ashore, Yeoman Second Class Fletcher located a suitable beaching point for disembarking our attack troops. Upon completing this dangerous task and observing several soldiers perilously close to drowning, he risked his life under an unrelenting shower of deadly machine-gun bullets to swim through extremely heavy surf and bring the helpless men to safety. Through his courageous efforts and heroic endurance in the face of withering fire, he was able to accomplish the successful rescue of the soldiers who otherwise might have perished. Yeoman Second Class Fletcher’s exceptional courage and valiant devotion to duty in the face of grave danger were in keeping with the highest traditions of the United States Naval Service. For extraordinary heroism and distinguished service in the line of his profession as Commanding Officer of Landing Craft Infantry Gunboat FOUR HUNDRED SEVENTY-THREE (LCI(G)-473), operating as a unit of LCI(G), Group EIGHT, in action against enemy Japanese forces during the close-in fire support operations against Iwo Jima in the Volcano Islands on 17 February 1945. Pounded and battered by enemy gunfire which inflicted severe damage and wounded half his crew as he boldly closed the beach within one thousand yards of heavy fortifications, Lieutenant Fisher fought his crippled ship with determined aggressiveness, releasing a full salvo of rockets against the enemy despite the deadly rain of heavy shells bursting on all sides and, directing his uninterrupted gunfire with steady accuracy, effectively maintained a furious barrage against Japanese coastal positions until the 473 was ultimately disabled and taken under tow from the field of combat. Undaunted by the terrific odds when his lightly-armored gunboat was attacked at sea by hostile aircraft and cast adrift from the towing vessel, he demonstrated outstanding fortitude and leadership, inspiring all aboard by his gallant acceptance of hardship as the small craft tossed helplessly throughout the night. By his great personal valor, indomitable fighting spirit and unceasing efforts to save his ship and personnel in the face of savage opposition, Lieutenant Fisher contributed materially to the success of this extremely hazardous mission and his resolute conduct throughout upheld the highest traditions of the United States Naval Service. For extraordinary heroism and distinguished service in the line of his profession as Commanding Officer of Landing Craft Infantry THREE HUNDRED FIFTY-SIX (LCI-356), in action against the enemy on 18 May 1945, during the assault on Okinawa Shima. Upon bring his ship alongside the blazing hull of a friendly destroyer (U.S.S. LONGSHAW), Lieutenant Wicklander, in the face of extremely hazardous conditions from enemy shellfire and exploding ammunition, bravely boarded the stricken vessel and with a party of men rescued the survivors and fought the raging fires. When advised salvage was impossible, he refused to leave the scene until a careful check was made and all wounded were removed to a place of safety. His outstanding courage, determination and conspicuous devotion to duty contributed immeasurably to the saving of many lives. His conduct throughout was in keeping with the highest traditions of the Navy of the United States. For extraordinary heroism and devotion to duty in action against the enemy while serving as Gunner on board Infantry Landing Craft U.S.S. LCI(L), ONE (LCI(L)-1), while participating in the amphibious assault on the Island of Sicily on 10 July 1943. Although the ship broached under pounding by the heavy surf while effecting an extremely hazardous landing on Caffi Beach, Gunner’s Mate Third Class Moore operated his gun with such skill and accuracy despite perilous exposure to a deadly rainstorm of bullets that he succeeded in silencing at least one and possibly two enemy machine-gun nests. Firing tenaciously in the hostile positions until his ammunition was exhausted, he contributed immeasurably to the safe disembarkation of troops from his and other beached landing craft. Gunner’s Mate Third Class Moore’s exceptional courage and valiant devotion to duty in the face of grave danger were in keeping with the highest traditions of the United States Naval Service. He gallantly gave his life for his country. For distinguished service in the line of his profession, extraordinary courage, and disregard of personal danger while serving as Medical Officer on board the Infantry Landing Craft U.S.S. LCI(L), THREE HUNDRED THIRTY-NINE (LCI(L)-339), that beached in the vicinity of Japanese occupied Lae, New Guinea, on 4 September 1943. 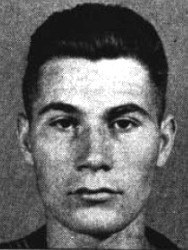 Though his ship was attacked repeatedly by enemy aircraft, Lieutenant, Junior Grade, Begor courageously continued to care for the wounded in the face of enemy bombing and strafing attacks, with total disregard for his personal safety, until he was fatally wounded. Lieutenant, Junior Grade, Begor’s professional ability, courage, and inspiring devotion to duty upheld the highest traditions of the Medical Corps and the United States Naval Service. He gallantly gave his life for his country. For extraordinary heroism and distinguished service in the line of his profession as Commanding Officer of Landing Craft Infantry Gunboat FOUR HUNDRED FORTY-ONE (LCI(G)-341), a close-in fire support ship operating as a unit of LCI(G), Group EIGHT, on 17 February 1945, while participating in the pre-invasion bombardment of Iwo Jima, Volcano Islands. In the face of heavy fire from Japanese coastal defense guns, Lieutenant, Junior Grade, Bell skillfully maneuvered his ship close to the beach, directing continued heavy fire on assigned targets in a conspicuously heroic manner. Despite many personnel casualties and serious material damage he continued to fight his ship most effectively until ordered to withdraw. By his courage, skill in combat and determination he contributed materially to the success of a most difficult operation. Lieutenant, Junior Grade, Bell’s exceptional courage and valiant devotion to duty in the face of grave danger were in keeping with the highest traditions of the United States Naval Service. For extraordinary heroism and distinguished service in the line of his profession as Commanding Officer of Landing Craft Infantry Gunboat FOUR HUNDRED SIXTY-NINE (LCI(G)-369), operating as a unit of LCI(G), Group EIGHT, in action against enemy Japanese forces during the close-in fire support operations against Iwo Jima in the Volcano Islands on 17 February 1945. Vigilant and determined, Lieutenant, Junior Grade, Connors penetrated the spreading curtain of devastating gunfire from powerful Japanese coastal positions to close the beach and deliver a steady barrage, blasting the enemy’s fortifications with unrelenting aggressiveness for more than an hour. With his firepower reduced as operational casualties disabled his main battery, he steadfastly remained on station and intensified the rate of fire from his 20-mm. guns until the heavy battery was again in operation. Ordered to withdraw from the field of combat when fires flared and the 469 began shipping water as a result of enemy gunfire, he effected damage control in a matter of minutes and, voluntarily returning to the firing line, again closed the beach in bold defiance of the pounding fury of Japanese shore batteries and continued to bombard defensive positions, persistently delivering heavy and short range fire despite additional hits and increasing personnel casualties resulting from the incessant counterfire. By his dauntless courage, indomitable fighting spirit and outstanding professional skill, Lieutenant Connors contributed materially to the success of this extremely hazardous mission and his valiant leadership throughout upheld the highest traditions of the United States Naval Service. For extraordinary heroism and distinguished service in the line of his profession as Commanding Officer of Landing Craft Infantry Gunboat THREE HUNDRED FORTY-SIX (LCI(G)-346), operating as a unit of LCI(G), Group EIGHT, in action against enemy Japanese forces during the close-in fire support operations against Iwo Jima in the Volcano Islands on 17 February 1945. Ordered into the field of enemy fire after several gunboats in his task force had been severely damaged, Lieutenant, Junior Grade, Gruver boldly defied the deadly rain of heavy shells bursting on all sides to close range and bring the 346 in position to render assistance to the stricken ships. Undaunted as the furious barrage laid down by powerful Japanese shore batteries continued unabated, he coolly directed his vessel in rescue operations and greatly assisted in the salvage of several badly battered ships. 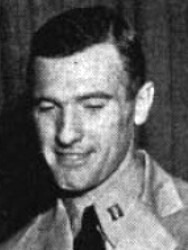 By his forceful leadership, indomitable determination and resourceful initiative in the face of shattering enemy fire, Lieutenant, Junior Grade, Gruver contributed materially to the success of this extremely hazardous mission. His exceptional courage and valiant devotion to duty in the face of grave danger were in keeping with the highest traditions of the United States Naval Service. For extraordinary heroism and distinguished service in the line of his profession as Commanding Officer of Landing Craft Infantry Gunboat FOUR HUNDRED SIXTY-SIX (LCI(G)-366), operating as a unit of LCI(G), Group EIGHT, in action against enemy Japanese forces during the close-in fire support operations against Iwo Jima in the Volcano Islands on 17 February 1945. 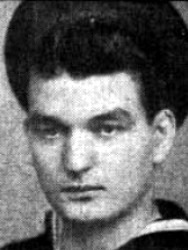 Boldly defying the devastating barrage, Lieutenant Horovitz moved his craft into the firing line, skillfully maneuvering close inshore to insure the effectiveness of his attack. With the enemy’s overpowering gunfire exacting a heavy toll of the lightly armored group he took over additional assigned sectors, and, keeping his guns trained on the beach, continued to blast the heavy coastal defenses with barrage rockets until his own guns were disabled and his ship severely damaged under the incessant pounding. Courageous and steadfast, he calmly maintained control of his crippled vessel and promptly reorganizing his crew, directed the valiant LCI to safety without further damage or casualties. 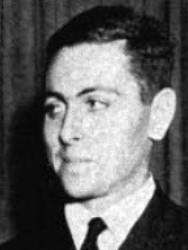 Lieutenant Horovitz’ dauntless perseverance, maintained in the face of overwhelming odds, contributed materially to the success of his group in paving the way for the invasion of Iwo Jima two days later and his stout-hearted devotion to duty throughout upheld the highest traditions of the U.S. Naval Service. For extraordinary heroism and distinguished service in the line of his profession as Commanding Officer of Landing Craft Infantry Gunboat FOUR HUNDRED FIFTY-SEVEN (LCI(G)-457), a close-in fire support vessel operating as a unit of LCI(G), Group EIGHT, in the pre-invasion bombardment of Iwo Jima, Volcano Islands, on 17 February 1945. In the face of intense fire from Japanese coastal defense guns and automatic weapons, Lieutenant, Junior Grade, O’Dowd skillfully maneuvered his ship and directed effective gunfire against the enemy beach until serious underwater damage necessitated the retirement of his ship. His conduct throughout was outstanding and distinguished him among those performing duties of the same character. Lieutenant, Junior Grade, O’Dowd’s exceptional courage and valiant devotion to duty in the face of grave danger were in keeping with the highest traditions of the United States Naval Service. For extraordinary heroism and distinguished service in the line of his profession as Commanding Officer of Landing Craft Infantry Gunboat FOUR HUNDRED SEVENTY-FOUR (LCI(G)-474), operating as a unit of LCI(G), Group EIGHT, in action against enemy Japanese forces during the close-in fire support operations in the pre-invasion bombardment of Iwo Jima in the Volcano Islands, on 17 February 1945. Under his cool and capable direction his guns continued to deliver intense and effective fire against the enemy although his ship was repeatedly struck by large caliber enemy shells. When it became apparent that his ship was in immediate danger of sinking, he skillfully maneuvered the heavily listing craft alongside a destroyer, and capably and efficiently supervised the evacuation of the many wounded. By his cool and capable action he undoubtedly saved the lives of several men who otherwise might have perished. While still under fire from the beach, he courageously led a volunteer party in an attempt to salvage the stricken vessel. His valorous conduct and tenacity of purpose were in keeping with the highest traditions of the United States Naval Service. For extraordinary heroism as Commanding Officer of the Infantry Landing Craft U.S.S. LCI(L), FIVE (LCI(L) #5), in action against enemy forces during the assault on Sicily on 10 July 1943. Although his ship was beached and broached during an intense and close hostile attack and was riddled by hundreds of shells and machine-gun bullets, Lieutenant Commander Caldwell skillfully fought his vessel throughout a one-hour period and succeeded in maintaining the fire from the guns on board until the ammunition supply was exhausted and in carrying out the landing of army troops on the enemy beach. By his superb professional skill, daring leadership and devotion to duty, Lieutenant Commander Caldwell contributed to the success of the engagement and upheld the highest traditions of the United States Naval Service. For extraordinary heroism and distinguished service in the line of his profession as Commanding Officer of Landing Craft Infantry Gunboat FOUR HUNDRED SEVENTY-ONE (LCI(G)-471), operating as a unit of LCI(G), Group EIGHT, in action against enemy Japanese forces during the close-in fire support operations against Iwo Jima in the Volcano Islands on 17 February 1945. By cool and capable direction he caused his ship to deliver effective gunfire against the enemy beach in the face of heavy fire from enemy shore batteries which caused heavy casualties to personnel and extreme damage to his ship. His performance of duty under the most adverse conditions was outstanding and his courage and conduct throughout were in keeping with the highest traditions of the United States Naval Service. For extraordinary heroism and distinguished service in the line of his profession as Commanding Officer of an Infantry Landing Craft LCI(L), during the initial landing operations against Japanese-occupied Lae, New Guinea, on 4 September 1943. 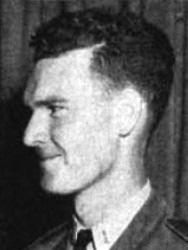 After skillfully landing his crippled landing craft, Lieutenant, Junior Grade, Rolf personally led a party in extinguishing numerous fires aboard and continued dangerous tasks under repeated Japanese strafing and bombing attacks until he was killed under fire. His inspiring leadership saved his ship for his country. 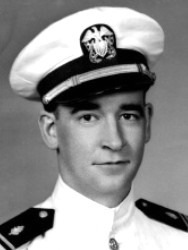 Lieutenant, Junior Grade, Rolf’s exceptional courage and valiant devotion to duty in the face of grave danger were in keeping with the highest traditions of the United States Naval Service. He gallantly gave his life for his country. For extraordinary heroism and devotion to duty in action against the enemy while serving on board the U.S.S. LCI (L) TWO HUNDRED TWELVE (LCI(L)-212), during an enemy air raid on the harbor of Palermo, Sicily, on 1 August 1943. When hostile bombs closely straddled his ship, setting fire to gasoline stored on the dock to which she was moored, and to ammunition loaded in a nearby merchant vessel, Quartermaster Second Class Sharp was seriously wounded by flying bomb fragments. Although in great pain and bleeding profusely, he manned the helm and engine room telegraphs and courageously remained at his station over an hour without revealing the extent of his injuries until his ship was anchored in a safer berth. The conduct of Quartermaster Sharp throughout this action reflects great credit upon himself, and was in keeping with the highest traditions of the United States Naval Service. 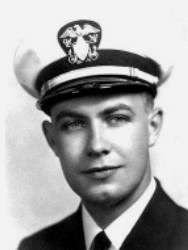 For extraordinary heroism and distinguished service in the line of his profession as Commanding Officer of Landing Craft Infantry Gunboat FOUR HUNDRED FIFTY (LCI(G)-450), operating as a unit of LCI(G), Group EIGHT, in action against enemy Japanese forces during the close-in fire support operations against Iwo Jima in the Volcano Islands on 17 February 1945. Determined to smash Japanese defenses, Lieutenant, Junior Grade, Brady fearlessly closed range to less than one thousand yards despite several large caliber hits from hostile shore batteries which started a serious fire, exploded ready ammunition aboard the 450 and wounded several of the crew. Firing a full rocket salvo well on the beach under terrific enemy fire, he resolutely remained on station and, directing a continuous barrage from his 40-mm and 20-mm batteries, effectively maintained a relentless bombardment of the strongly fortified Japanese positions until recurring fires and explosions aboard his gallantly fighting ship forced his withdrawal from the field of combat. By his great personal valor, indomitable fighting spirit and tenacious perseverance in the face of fanatic opposition, Lieutenant, Junior Grade, Brady contributed materially to the success of this extremely hazardous mission and his aggressive leadership throughout the bitter engagement upheld the highest traditions of the United States Naval Service. For extraordinary heroism and devotion to duty in action against the enemy while serving aboard an Infantry Landing Craft LCI(L) 339 , during the initial landing operations against Japanese-occupied Lae, New Guinea, on 4 September 1943. 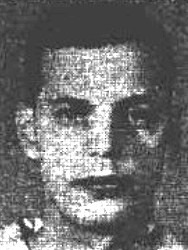 When a direct hit demolished the radio room of the LCI on which he was serving, although severely wounded, Radioman Second Class Smith proceeded to the bridge and replaced the injured helmsman at the wheel. After steering the ship to a beach, he returned to the damaged radio room and labored valiantly to restore equipment to service until he lost consciousness. 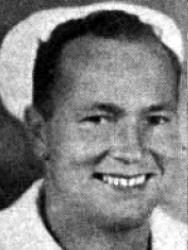 Radioman Second Class Smith’s exceptional courage and valiant devotion to duty in the face of grave danger were in keeping with the highest traditions of the United States Naval Service. For extraordinary heroism and distinguished service in the line of his profession while serving as Commander of a Group of Reconnaissance Support Ships, in action against enemy Japanese forces during the assault and capture of Iwo Jima, Volcano Islands, on 17 February 1945. With his unit receiving accurate and intense hostile fire and suffering numerous casualties, Lieutenant Commander Nash directed his ships in successfully delivering devastating counterfire onto enemy shore positions, making it possible for the reconnaissance parties ashore to obtain vital information for use in the main landing assault to follow. By his gallant leadership and courage, he contributed materially to the success of the operation, and his devotion to duty was in keeping with the highest traditions of the United States Naval Service. 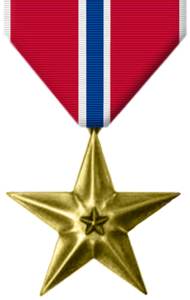 The Silver Star Medal, unofficially the Silver Star, is the United States military’s third-highest personal decoration for valor in combat. For conspicuous gallantry and intrepidity in action on 17 February 1945, while serving aboard the U.S.S. LCI(G)-457, a close-in fire support vessel, during the pre-invasion bombardment of Iwo Jima, Volcano Islands. Under most hazardous conditions, without regard for his personal safety, by his capable performance of duty, he undoubtedly saved the lives of several of his wounded shipmates. His courage and conduct throughout were in keeping with the highest traditions of the United States Naval Service. For conspicuous gallantry and intrepidity in action while serving as Commanding Officer of Landing Craft Infantry Gunboat FOUR HUNDRED SEVENTY-THREE (LCI(G)-473), operating as a unit of LCI(G), Group EIGHT, during the amphibious assault on an enemy Japanese-held island in the Pacific Area in July 1944. Repeatedly exposing himself and his ship to intense enemy fire in order to gain more advantageous striking positions, Lieutenant Fisher vigorously supported the actual landings of the assault forces and subsequently provided excellent protection for the flanks of the advancing troops. His courage and expert control of his vessel’s gunfire during this vital operation were in keeping with the highest traditions of the United States Naval Service. For conspicuous gallantry and intrepidity as Commanding Officer of the LCI(R) 1068, in action against enemy Japanese forces during the assault on Okinawa Shima, 21 May 1945. 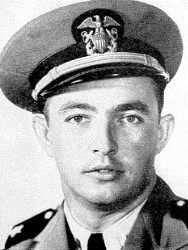 When a report was received that an Army observation plane had crashed behind the Japanese lines, Lieutenant Budke took his ship into the reef-filled harbor in an effort to rescue two aviators believed to be hiding in a wrecked hull close by the hostile shore line. Despite considerable shrapnel damage and a direct hit by a large caliber shell which ripped a three by three foot hole in the forward fuze magazine of his ship, necessitating a withdrawal for temporary repairs, Lieutenant Budke returned and continued to search the wreckage until convinced no living persons were aboard. His courage and devotion to duty were in keeping with the highest traditions of the United States Naval Service. For conspicuous gallantry and intrepidity in action on 17 February 1945, as a member of the crew of the U.S.S. LCI(G) 449, a close in fire support ship, during the assault on Iwo Jima. After his ship had been seriously damaged by enemy action and numerous casualties were suffered, he, with outstanding initiative, successfully administered medical care to the wounded, and saved many lives. His profound devotion to duty, in the face of continuing enemy fire, proved to be an inspiration to all. His courage and conduct throughout were in keeping with the highest traditions of the United States Naval Service. For conspicuous gallantry and intrepidity in action on 19 February 1945, as the Engineering Officer of a close-in fire support ship during the assault on Iwo Jima. After his ship had been seriously damaged by enemy action and raging fires ensued, he, in the face of continuing enemy fire, ably organized the surviving personnel and directed the fighting of the fires and the control of damage. His outstanding action, performed in the face of extremely difficult conditions, contributed materially to the saving of his ship. His courage and conduct throughout were in keeping with the highest traditions of the United States Naval Service. For conspicuous gallantry and intrepidity in action as Commanding Officer of the U.S.S. LCI(L) 188 during the amphibious invasion of Sicily on 10 July 1943 and the assault on Italy on 9 September 1943. During the invasion of Sicily the LCI(L) 188, loaded with troops and mortar equipment, struck a san bar when nearing the assault beach. 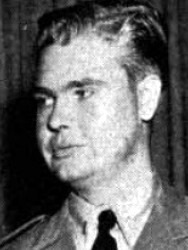 Ensign Billheimer, while subjected to heavy enemy fire, with great courage expertly maneuvered his ship clear and safely landed the troops on the assigned beach, thereby materially contributing to the invasion. Later, during the invasion of Italy, his ship was ordered to the beach ahead of schedule in order to reinforce a position that was under heavy enemy attack. 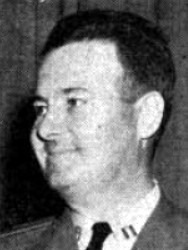 With great skill and expert seamanship, Ensign Billheimer beached his ship and in record time discharged the embarked troops, thereby greatly contributing to the success of the invasion of Italy. The prompt and decisive action, fearless leadership under fire, and outstanding devotion to duty displayed by Ensign Billheimer were in keeping with the highest traditions of the United States Naval Service. 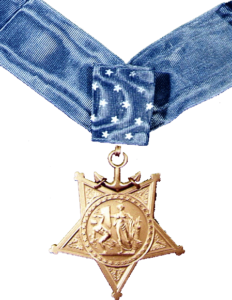 For conspicuous gallantry and intrepidity in action on 17 February 1945, as a member of the crew of LCI(G)-474, a close-in fire support ship during the assault on Iwo Jima. After his ship was left sinking as a result of an enemy bombardment, he, although still under enemy fire, directed the organization of a damage control party. He then supervised the attempts to plug a large water line hole while working in four feet of water and oil and bravely remained at his post of duty until ordered to abandon ship. Through his initiative and courage, he proved to be an inspiration to all. His courage and conduct throughout were in keeping with the highest traditions of the United States Naval Service. For conspicuous gallantry and intrepidity while serving as Commanding Officer of Landing Craft Infantry Gunboat FOUR HUNDRED SEVENTY-FOUR (LCI(G)-474), a fire support ship, during the actual assault upon and capture of an enemy-held island during July 1944. Lieutenant, Junior Grade, Reichl constantly exposed himself and his ship to enemy fire without regard to his personal safety. He closely supported the actual landing of the assault troops, then vigorously protected the flanks of our troops from enemy attack. The vigorous and gallant offensive displayed by his command is a reflection of the leadership and ability of the Commanding Officer. He performed his duty in an outstanding and most gratifying manner and contributed greatly to the success of the operations. His conduct was at all times in keeping with the highest traditions of the United States Naval Service. For conspicuous gallantry and intrepidity in action as Commander of a Landing Craft Infantry [LCI(L)] unit engaged in operations for the capture of the southern half of Kwajalein Atoll and Eniwetok Atoll, Marshall Islands, during the period from 28 December 1943 to 28 February 1944. With cool and capable direction, and in an outstanding manner, he operated his ships in the face of enemy gunfire at close range and under difficult navigational circumstances. In one landing, his flagship and two ships of his unit were badly damaged by gunfire, in spite of which he continued the landing of troops. His conduct through was in keeping with the highest traditions of the United States Naval Service. 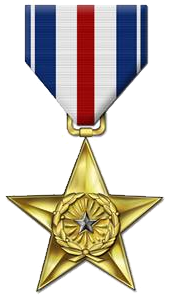 For conspicuous gallantry and intrepidity in action as Commanding Officer of an LCI(G), during the amphibious assault on an enemy Japanese-held island in the Pacific Area, in July 1944. Repeatedly exposing himself and his ship to intense enemy fire in order to gain more advantageous striking positions, Lieutenant Commander Nash vigorously supported the actual landings of the assault forces and subsequently provided excellent protection for the flanks of the advancing troops. His courage and expert control of his vessel’s gunfire during this vital operation were in keeping with the highest traditions of the United States Naval Service. 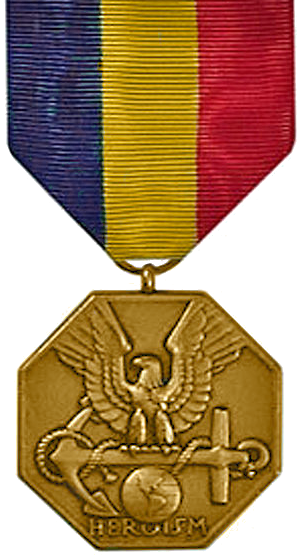 For meritorious achievement as Commander of a group of close-in fire support ships during the assault and occupation of an enemy held island, July 1944. Assigned the mission of providing close-in fire support for a unit of our force engaged in the hazardous operation of preparing the southern landing beaches for our force, Lieutenant Commander Blanchard coolly and capably led his group alongside the coral reefs to close the enemy batteries and fire on targets of opportunity. Although opposed by machine gun and rifle fire, his ships ably assisted in keeping down enemy opposition so that the unit could successfully complete its important mission. His conduct throughout distinguished him among those performing duties of the same character. The Navy and Marine Corps Medal is the highest non-combat decoration awarded for heroism by the US Navy to the members of the United States Navy and United States Marine Corps. For heroic conduct while serving aboard the LCT 35 during the landings at Anzio, Italy, in January 1944. A heavy enemy aerial attack developed and a large bomb struck close to the LCI(L) 211, moored in the harbor. The LCT 35 was shifted alongside the stricken craft and he and his comrades disregarded their own safety to remove wounded men and bring the fires under control. Their efforts contributed materially to the probable saving of several lives. For heroism while serving on board the U.S.S. LCI(L) 209 while effecting a rescue at sea on 26 January 1944. The U.S.S. LCI(L) 209 went to the rescue of survivors of a British landing ship which had been bombed in action and set on fire. Lieutenant, Junior Grade, Brown exhibited initiative and extreme courage in diving into the sea and swimming with a line to men who were struggling in the water without life preservers alongside the burning ship. This valorous and forthright action on his part was accomplished at a time when there was imminent danger of being crushed between the two ships surging in the heavy wind and sea and contributed directly to the saving of several lives. 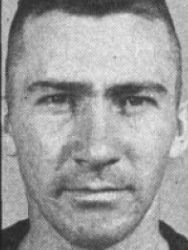 The extraordinary heroism, prompt and decisive action, and outstanding devotion to duty displayed by Lieutenant, Junior Grade, Brown were in keeping with the highest traditions of the United States Naval Service. For heroic conduct when the ship in which he was serving, the LCI(L) 32, was struck and sank in less than three minutes on 26 January 1944 near Anzio, Italy. Coxswain Marcey assisted the injured and dazed in fastening and inflating life jackets. After the abandon ship order was given he continued to search the ship for those who needed aid. Later, he left his life raft twice to search for and recover survivors from the cold and heavy seas. For heroism while serving on board the U.S.S. LCI(L)-32 during the advanced landings in the Anzio – Nettuno area, Italy, on 26 January 1944. While the U.S.S. LCI(L)-32 was approaching a bombed and burning landing ship in heavy weather in order to rescue survivors, the ship struck an enemy mine and sank in less than three minutes. Lieutenant, Junior Grade, Arthur, although he had received a crippling leg injury, exerted all efforts to assist the injured and dazed in preparing to abandon ship. Until the end he continued helping others over the side into life rafts and was among the last to leave the ship before it sank. While in the cold and heavy seas, his admirable spirit was an inspiration to the survivors floating in the water and his persistent efforts in signaling for assistance were largely responsible for their quick recovery by rescue ships. 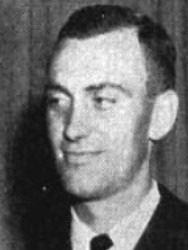 The extraordinary heroism, complete disregard for his personal safety, and outstanding devotion to duty displayed by Lieutenant, Junior Grade, Arthur were in keeping with the highest traditions of the United States Naval Service. 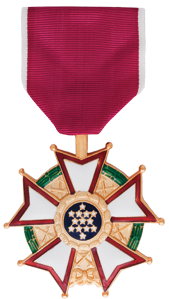 For exceptionally meritorious conduct in the performance of outstanding services to the Government of the United States as commander of an LCI(L) flotilla during the occupation of the Treasury Islands and in evacuation operations on Choiseul Island during World War II. Captain Smith showed courageous leadership and gallant devotion to duty. Beaching his ship on Japaneseheld Choiseul Island during the black of night, he skillfully evacuated troops of a Marine battalion in 12 minutes without casualty to embarking troops or damage to his ships.